When I first reached Chiang Mai some weeks back, I met a couple living there at a motorcycle accessories shop. 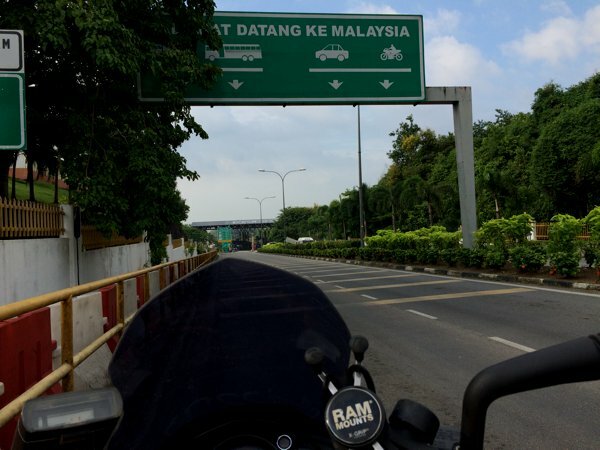 They were preparing to ride into Indonesia on a multi-week trip, but doing it slowly. So we’ve exchange facebook contacts, and have sort of kept lightly in touch since. While facebook surfing the night before, I realised that the couple was in Georgetown, Penang! So I contacted them both, and made arrangements to meet up for lunch in Penang. Goodbye Thailand! It has been an amazing trip! Crossing from Sadao into Bukit Kayu Hitam was painless. Sadao seem to have started operating from their new immigration building. It was definitely there (couldn’t have sprung up overnight), but I didn’t remember seeing the new immigration building, and definitely remembered using the old immigration booths. 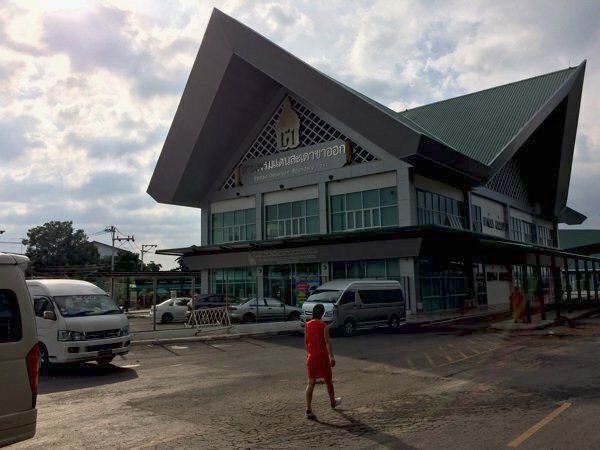 The new immigration complex in Sadao, Thailand. Rode up to the immigration booth, got my passport exit stamp, surrendered my TM2 and TM4 (motorcycle “immigration”) forms and scooted ahead. Reached the customs counter just about 15m ahead, stopped by the roadside and surrendered my motorcycle customs form. All done within 2 minutes. No fees. It was even simpler on the Malaysia side. Got my passport stamped at the immigration counter and off I went! No queues, no fuss, no fees. And before long, I entered into very familiar territories. 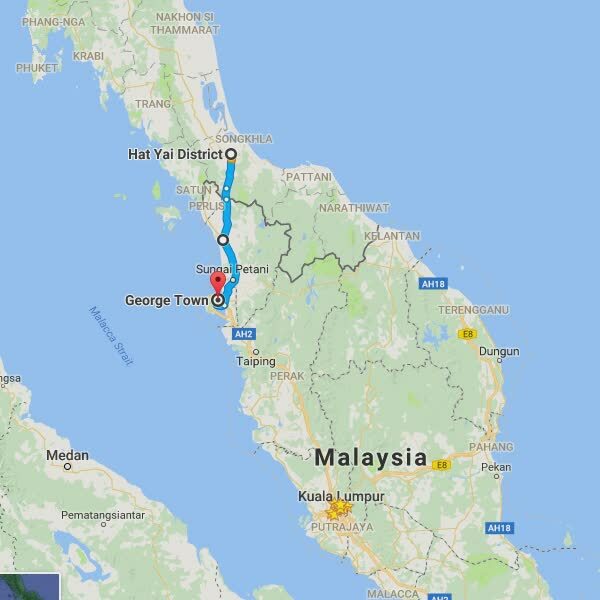 You see, Singapore borders Peninsular Malaysia on the south and I make rather frequent trips into Malaysia. 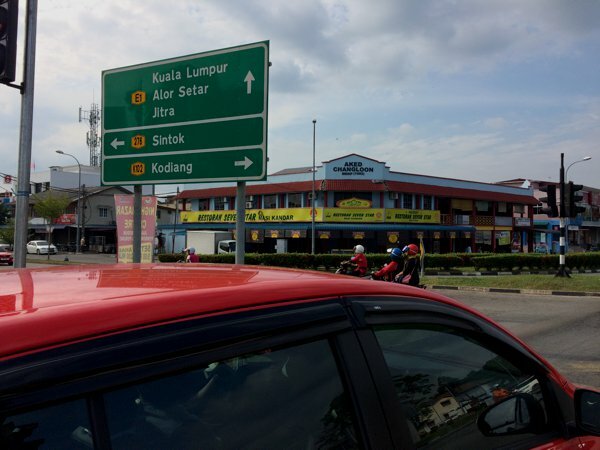 And so it *almost* felt like home the moment I crossed the border of Bukit Kayu Hitam. Familiar highway postings on the Malaysian highway. Just before I crossed the border, I recalled that Malaysia (and Singapore) is 1 hour ahead of Bangkok time. I had arranged to meet Michel and Pim at “11’oclock”. While my GPS suggested that I should arrive in Georgetown by 1030h, it really was 1130h in Malaysia! I just lost 1 hour by crossing the border! Michel needed to do a slightly early lunch as he needed to visit the Thai embassy in Penang at 2pm to get some visa matters sorted. Lunch with Michel and his wife, Pim. 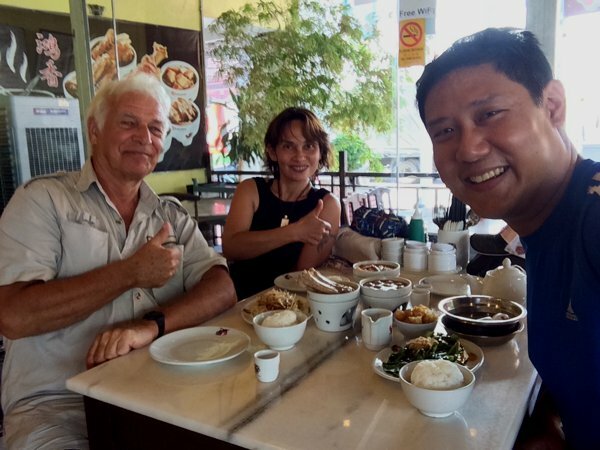 I introduced them to Bah Kut Teh – pork rib soup. It is always so nice to meet fellow motorcycle travellers, and definitely very nice to meet them again! 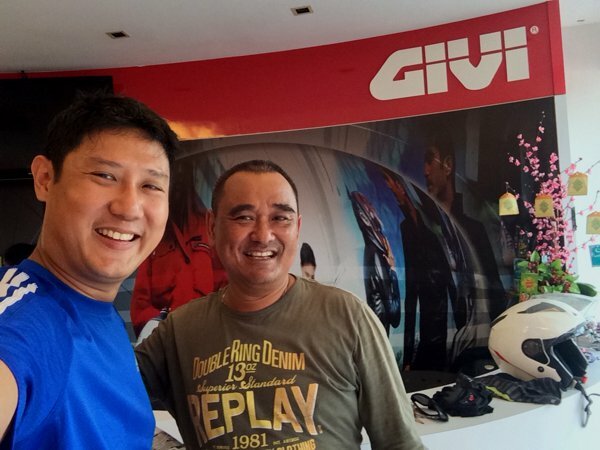 After lunch, I headed to the Givi shop in Penang. The right side of my E22N pannier broke when I fell in northern Laos. I’ve been keeping it together with a tie-down strap since then. And since there was a Givi shop here, I thought I’ll head over to get a replacement box for my broken one. 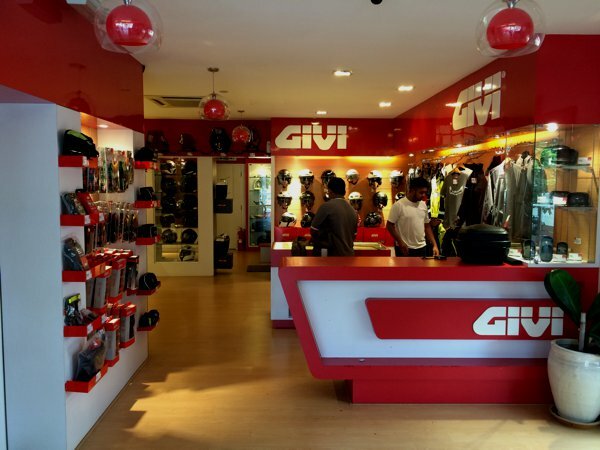 The Givi shop in Georgetown, Penang. 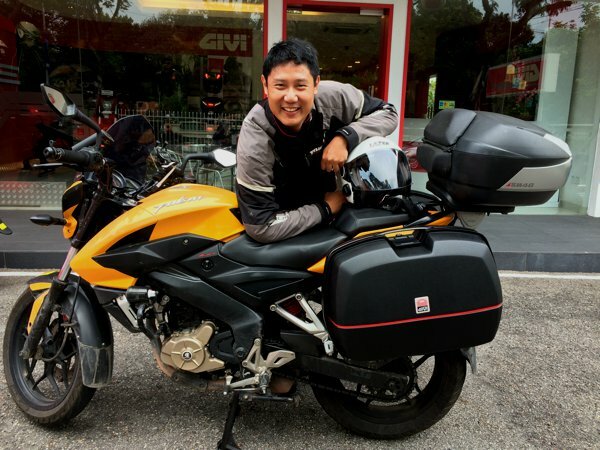 I love my Givi E22N panniers. They’re large enough to keep my stuff but slim enough to maintain lane splitting abilities. I’ve reviewed them here when I got them in May this year. But for the purpose of this tour, the E22’s were a little too small. I wished I had larger side boxes for touring. So when I got there, I asked the Givi Guy if there were anything that’s bigger for touring, but still able to fit the existing mounts I have. I wanted the ability to swap the E22N’s to something larger when I tour, and then back to the E22N again when I’m in commuter mode. Givi E36N’s on my Pulsar 200NS. With these slapped on, my Pulsar 200NS is now officially a BIG BIKE. The E36N’s look like hard shell travelling luggages slapped to the side of my motorcycle. Way, way, way more storage space than the E22N’s. Reduced lane-splitting abilities in exchange for a lot more storage. The Givi Guy also took the time to readjust my mounting brackets and installed an additional horizontal brace bar. He commented that the existing installation appeared to be a shady job – definitely NOT from a Givi authorised dealer. After the Givi modification, my pannier brackets are now significantly sturdier. 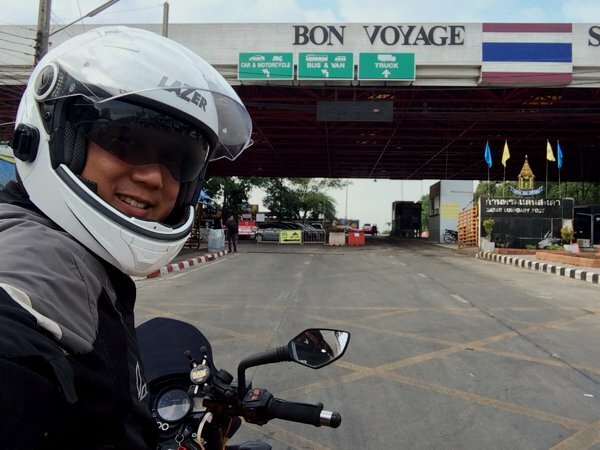 While waiting for Givi to adjust my pannier brackets, I had a long chat with Leonard – a fellow motorcycle adventurer in Penang. After the acquisition, I headed back to the hotel to link up with Michel and Pim again. We had agreed to do dinner together. 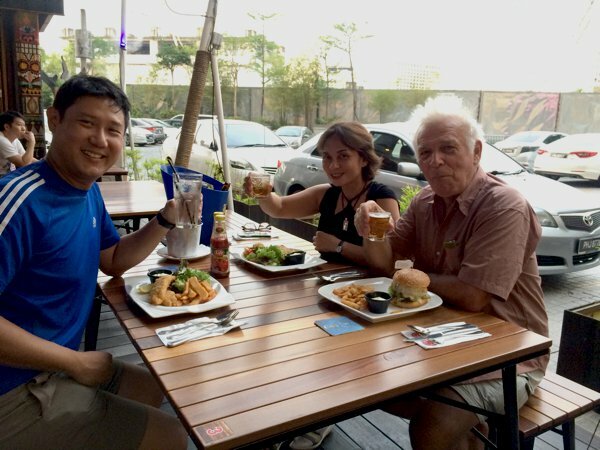 Michel was yearning for some hamburger and we went to Penang Times Square to get him some. Michel insisted to buy me dinner. Thanks for the wonderful food AND especially company, Michel and Pim! Hi D, out of curiosity how did you bring back the e22n panniers back with you to Singapore? I didn’t. It broke – at least 1 side did. And the other side was wearing out. So I dumped it in Penang and brought back those E36N’s instead. But I did purchase a new set of K22N’s (Kappa’s version of the E22N) when I got back to Singapore though.